Ahoy from Isla San Marcos on the Baja side of the Sea of Cortez! We just pulled into Sweet Pea Cove on Isla San Marcos after an unevnetful passage from Guaymas. Yesterday we finished the majority of the work items on our list and pulled off of the dock late in the afternoon and positioned ourselves at a delightful anchorage near the entrance to Guaymas. 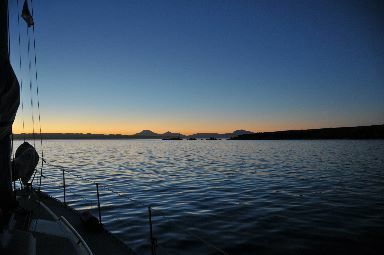 At 5 AM, while it was still very dark, we departed for an 82 mile passage to Isla San Marcos. The predictions of following winds were correct, but unfortunately the winds were too light to sail so we motor-sailed. We needed (or shall I say "I wanted") to pull into the anchorage, where we had never been, while it was still light as the guides warn you about submerged rocks surrounding the island. Sunrise and sunset were at about 6:30 AM/PM, so that meant that we had about 13+ hours of light. By leaving in the dark at 5 AM and estimating 6 kts, that gave us a good margin of error. As it turned out we made it in less than 12 hours and were anchored before 5 PM. We left in fog, which cleared, and then ran into a dense fog bank as we approached the island. Hardly ideal, but I gave us plenty of room around the island as we couldn't see it. Thankfully as we were rounding the island, the fog cleared (above photo). I'm guessing that the clearing was due to the heat of the island burning off the fog and generating it's own micro-climate in a dense fog bank. Regardless, the entire island was surronded by a fog bank and we were in the clear. Yeah! As a result we had no problem navigating in and getting anchored. All that I'll say is that it was 5 o'clock here and we're relaxing with a glass or two of wine. Tomorrow we'll head S, but I don't know where we'll drop hook again. Now it's time for showers, dinner and a good night's sleep. We had a great night at anchor with brilliant stars and calm winds. I (singular) awoke before daybreak to the sounds of fish jumping and seabirds calling to one another. The sky and landscape was a study in plum tone pastels. Ah, this is why we do this! We spent the night at Isla Pajaro (27-53.458N 110-50.781W) anchored in about 15' of mud. Glad that we didn't choose Pitahaya as that was a very industrial location filled with stinky fish smoke and smells. Yuck! We're anchored on Isla San Marcos at Sweet Pea Cove (27-14.032N 112-06.240W) on Isla San Marcos in 24' to the S of the fish camp. Good protection from E winds. P.S. The pictures won't display until we get Internet and I can upload them.